Mr. Norton began his career in technology and systems with the United States Navy in 1972, serving in the U.S. Nuclear Submarine Fleet. The Navy provided him with an educational and practical experience foundation in applied technologies, systems engineering, programming, operations and project management. As a consultant, his clients include top tier Management Consulting firms, Fortune ranked corporations, several of the leading enterprise software firms, a number of Federal and State Government Agencies and a nationally ranked University System. 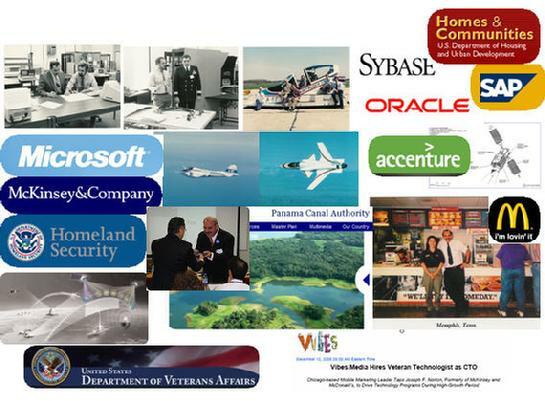 A partial list of my current and past consulting clients includes: Federal Express, Cisco Systems, Peoplesoft, SAP, Microsoft, McDonald’s Corporation, Panama Canal Authority, Bristol-Myers, U.S. Army Tacom, Fisher Scientific, Nationwide Insurance, ARAMARK, State Farm Insurance, PepsiAmericas, Baxter International, Honeywell, U.S. Department of Housing & Urban Development, Naval Supply Systems Command, University of Illinois, Boise Cascade Corporation, Nextel, Georgia-Pacific Corporation, Eaton Corporation, British Airways, Accenture, the State of Illinois, IBM, U.S. Veterans Administration, BlueCross BlueShield Association, Harrah’s Entertainment, Hudson Highland Group, National Equity Foundation, Mercury Interactive, OMG, Prosperiti, Simon Property Group, SmithersOasis, CCC Information Services, Dollar Thrifty Auto Group, HIMSS, Novartis and the Chicago Olympic Bid Committee.